Appallingly, many children who need them are denied free school meals on the basis of their parents’ migration status. 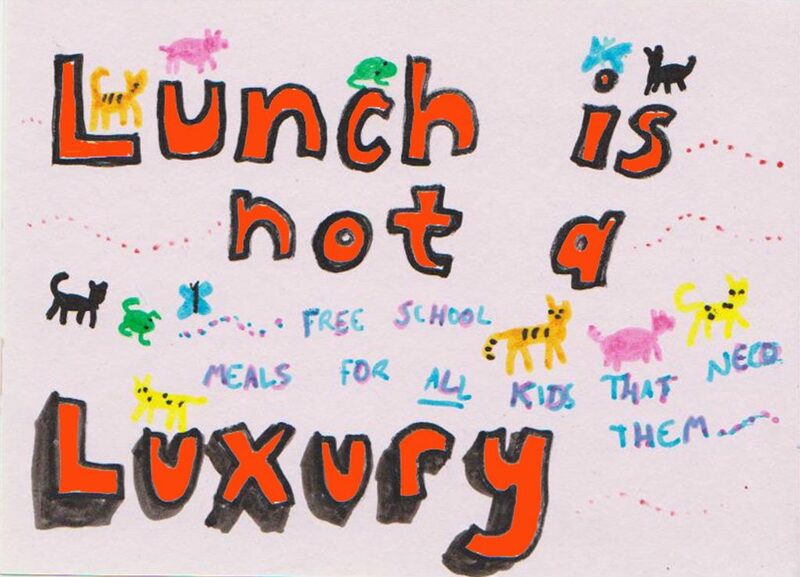 We’re working with North East London Migrant Action (NELMA) to support their campaign demanding free school meals for every child who needs them. Labour should commit to ending this and other injustices related to “no recourse to public funds” anti-migrant policies, and organised workers – especially school workers, when it comes to school meals – can be a powerful force in the fight. Very soon, we’ll have materials and actions for local Labour parties and trade union branches to take up – keep your eyes peeled, and for now you can read more about the issue from NELMA. For starters, below is a model motion for associations/districts to submit to the next annual conference of the National Education Union (the new union formed by the merger of the NUT and ATL). If you’re a member of the NEU, please submit it to your association/district as soon as possible – the deadline for motions to be voted through associations/districts and sent by them to NEU HQ is 3 December (details here). Please email us at info@labourfreemovement.org to let us know if you’re submitting it. Children in years 3 and above cannot receive free school meals (FSMs) if their parents are migrants with leave to remain subject to a “no recourse to public fund” (NRPF) condition, or are undocumented. These are often some of the poorest and most vulnerable children in our schools. Many report going hungry; where meals are provided, parents receive bills they cannot afford to pay. A few schools and local authorities use their discretion to provide them FSMs, but have to find extra funds to do so. North East London Migrant Action (NELMA), with the support in the labour and trade union movements of Labour Campaign for Free Movement (LCFM), are campaigning for all children who need them to receive FSMs and to end NRPF policies, and until this is secured, for local authorities to supply FSMs unilaterally. No child should go hungry in our schools because of who their parents are. We oppose the inhumanity and racism of such “hostile environment” policies. Denial of FSMs stops children reaching their potential – malnourished children cannot learn to the best of their abilities. NRPF policies undermine all workers: when migrant workers are afraid that losing their job means their children will go hungry or they will have no social security to fall back on, they are more vulnerable to mistreatment by exploitative employers, undermining pay and conditions for all of us. Send our support to NELMA and LCFM for the campaign to repeal this and all the discriminatory NRPF-related policies, and for local authorities to meet the need for FSMs in the interim. Lobby government and political parties to this end. Send relevant briefing information and campaign materials to branches and encourage them to involve our members in campaigning activities such as lobbying, letter-writing and protesting, where possible joining with local families, communities and migrant support groups.